Ever need to sound really salty? The Eagle's seamanship manual is on Google! Never forget that when a squall approaches, it is prudent to fake out the spanker. http://www.se-radio.net/ is my current favorite for technical podcasts. In superview coordinates. Changing this moves the view but doesn't redraw. From 0,0. It's the size of the view. • The indicators on things like voicemail (to tell you you have N voicemails) are badges. Set them with the badgeValue property. • Nib files - most objects are going to get an initWithCoder: message when they're instantiated. See the Resource Programming Guide, The Nib Object Life Cycle. 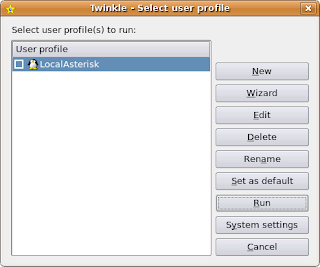 If you want to use Twinkle on the same machine as your asterisk instance, you'll need to change the SIP port that Twinkle uses. 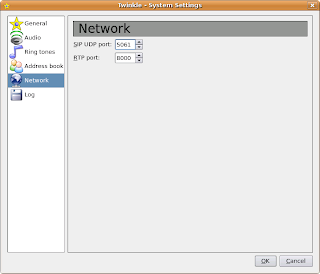 Assuming asterisk is up an running, you'll get this error message when you start Twinkle: Failed to create a UDP socket (SIP) on port 5060 Address already in use Hit "System Settings" on this screen: And then choose network: Change the SIP port to 5061 and it'll start up and connect to your local asterisk instance. I thought I needed to move my old blog from Mephisto to here. It looks like the way to do it would be to go via WordPress using this tool, and then to Blogspot using this. Eventually I'll get around to making that happen. But when I was going through my old posts, I realized that most of what was there dated fairly quickly. I'll probably just move over a couple posts by hand and not worry about the others.